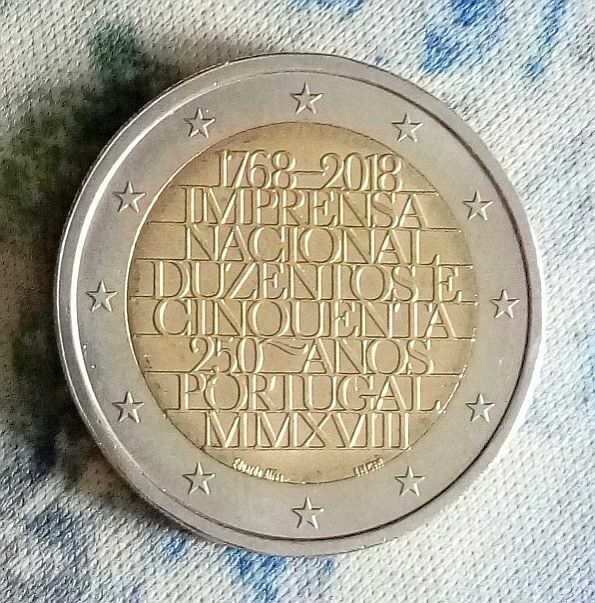 Got another one yesterday from a bank branch in Lisbon. I found amongst my 1 and 2 cent coins a 2€ "UEM 1999-2009" I don't know when I have gotten it, but it was nice surprise to find it. I found also a 2€ 2004 from the same place. I've spend the weekend in Germany. 6 new dots, a hit and I received the 2018 Birth of Helmut Schmidt in a tankstation. 2€ 2010 "200th Anniversary - Botanical Garden of Ljubljana"
This beauty was given to me as a regular change! 2€ CC 2016 François Mitterrand, today in the cafeteria of the hospital where I work in Ceuta. 2€ CC 2010 Appel 18 Juin, last Friday in the ferry between Ceuta and Algeciras. 2€ CC 2017 Rheinland-Pfalz, today in a bus in Ceuta. I got a Latvian commemorative 2€ from the year 2015.
he was on holiday in Italy and passed Austria. I was on the train, yesterday, German IC from Westerland to Stuttgart. I have a feeling someone has used a coin collection to pay for coffee and beer in the bistro car. I got, in two to three times, an 2008 Diritti Umani, a 2007 Treaty of Rome (D), a 2013 F.E. Sillanpää and a 2016 Sachsen (J) in good condition.